I prefer text editors to word processors. The formatting behavior in a program like Word or Pages feels like it’s working against me more often than not, and the (perceived) lack of precision and predictability makes me uneasy. I’d rather just use Markdown syntax, or even handwrite HTML tags. There are a billion apps that cater to this sort of fussiness, and every so often I explore my options. Recently I’ve been using iA Writer. I like it, although honestly I’d be fine with Byword or Ulysses or any number of similar apps. What really made iA Writer stand out to me was its fonts. In contrast to proportional fonts that communicate “this is almost done” monospace fonts suggest “this text is work in progress.” It is the more honest typographic choice for a text that is not ready to publish. This rang true to me, and was something I’d never considered before: maybe part of the reason I like writing in plain text is that the apps I use display my words in a monospace font like Menlo or Courier (or, in iA Writer’s case, Mono) instead of a proportional font like Helvetica or Times New Roman. Quattro shares similarities with a proportional typeface. At the same time, it retains a lot of the technical virtues of the classic typewriter fonts using wider gaps between the words and giving each letter more room than a classic, fully proportional face. That blog post has an image illustrating the differences between Mono, Duo, and Quattro. In short: Duo has a handful of 1.5× width characters, while Quattro adds some 0.75× and 0.5× width ones as well. It works wonderfully, in my opinion. Quattro still looks like a monospace font in some abstract way, but doesn’t have the clunkiness of an actual monospace font. It’s my new favorite font to write with. iA’s fonts are available on GitHub if you’d like to try them yourself. I love pretty much everything about the Splatoon series: the aesthetic, the music, the ink mechanic, even the weird post-apocalyptic lore. Since I generally prefer single-player games, though, I fell off of both games pretty quickly once I finished the campaign and grew tired of online head-to-head matches. So Octo Expansion is exactly the sort of thing I wanted from Splatoon but never dared to hope that they’d make. It feels like I’ve been dropped into a series of special challenge levels in some alternate universe Super Mario Galaxy. At the beginning of the year I would have expected to have Octopath Traveler or Ni no Kuni II (or both) on this list, but in the end I wasn’t especially fond of either. Dragon Quest XI is not without its own problems—in particular, it has one of my least favorite JRPG soundtracks in years, and it plays straight a bunch of genre tropes that should have been left in the 1990s—but its fundamental charm and rock-solid mechanics still shine through. This is my third or fourth time trying to get into Dragon Quest, and it’s finally stuck. 8. BanG Dream! Girls Band Party! I imagine this is the least familiar title on here. Bang Dream is a cross-media franchise about a group of anime girl musicians, spanning anime, manga, games, albums, and even real-life concerts featuring the voice talent (cf. Idolmaster or Love Live for similar franchises). Girls Band Party is Bang Dream’s mobile rhythm game. Imagine a version of Dance Dance Revolution that you play with your fingers, wrapped in the usual mobile game trappings like stamina meters and weekly events and gachapon pulls. It’s the first game in this surprisingly crowded subgenre to hook me since the analogous Love Live game, School Idol Festival, a few years back. The two standout features for me: a steady drip feed of new songs (including covers from outside of the franchise), and the ability to keeping playing even if you don’t have any stamina (with fewer in-game rewards, which suits me fine). Between Early Access, episodic releases, expansion packs, and games as a service, it’s increasingly unclear where to draw the lines for “game of the year” eligibility. In the case of Hollow Knight, its 2018 Switch port earned it a place in many discussions despite the fact that it was originally released in 2017. I don’t really have a stake in the procedural arguments about what “year” means in “game of the year,” but since I’m one of those players who discovered Hollow Knight once it made it to Switch I’m including it here. I don’t have too much to say about it yet; it’s great so far, and I suspect it would be higher on my list if I’d had a chance to get further into it. Ten years ago, the first post on my new games blog Cruise Elroy argued that the just-released Super Smash Bros. Brawl was a fine game, but was actually most successful as a game museum. I could write a similar blog post about Ultimate, I think—it’s largely the same game as ever and is still fun to play, but the main appeal for me remains those moments where I think “Oh hey, it’s that character (or song, or stage) from that game!” As such, my biggest disappointment isn’t a missing gameplay feature like Home Run Contest or Subspace Emissary, but a missing curatorial feature: the collectible Spirits don’t have little descriptive blurbs or debut dates like the trophies from earlier Smash games. This is the most surprising entry on the list for me. I don’t generally get into multiplayer games, as I mentioned above, and I didn’t care for the single-player campaign here (as opposed to Ultimate’s World of Light, which I enjoyed). I don’t even like most of Aces’s mechanics—the special moves and trick shots are too gimmicky for my taste. But playing in “Simple” mode, which turns Aces into something closer to Virtua Tennis, is just sublime—it’s some of the most fun I’ve had playing a video game all year. A few days ago YouTube recommended me a video of two world-class Simple players facing off and I was completely riveted. I’ve been holding off on Nintendo’s online subscription service, but this game will probably be the reason I break. One way I think about Tetris Effect is that it does for Tetris what the Disney film Fantasia does for classical music: it adds a new aesthetic dimension to a familiar experience, transforming it in the process. Playing Tetris Effect is a profoundly different experience from playing a “regular” version of Tetris, in the same way that watching Fantasia is profoundly different from just listening to Beethoven. Another more cynical way I think about Tetris Effect is that it’s what happens when you cross Tetris with a Coexist bumper sticker, or a Dr. Bronner’s soap bottle. The narrative subtext of all its audiovisual flair is an uncompromising faith in humanity, which is a bit cornball at times. It’s hard not to be won over by how optimistic it feels, though; I can find it in my heart to give a relentlessly positive game a pass in 2018. Dragalia Lost is a mobile action RPG co-developed by Nintendo and Cygames (of Granblue Fantasy fame). It’s one of those games where seemingly everything has a progress bar: you level up your castle, your buildings, your weapons, your characters, your characters’ abilities, your “wyrmprints” (equippable buffs), your dragons, your dragons’ affinity levels, and even yourself. If you like to make numbers go up, you’ll find a bunch here to play with. Besides the grinding, there are also gacha pulls (naturally), Fire Emblem-esque unlockable character stories, MMO-lite raid battles, and a surprisingly catchy soundtrack. Nothing about it feels especially groundbreaking, but virtually everything is well-executed and polished. I continue to be surprised by how much time I spend with it, even when the specific things I’m doing don’t sound appealing on paper. I remember describing Celeste to a friend as “difficult without being frustrating,” but that’s not quite right—it absolutely is frustrating sometimes, and intentionally so. A better description might be “frustrating without being unpleasant.” Frustration, like tedium or repetition or anything else, can be used as a tool; Celeste employs it to make Madeline’s story resonate. By the end of the second chapter, I wanted to climb that damn mountain as much as she did. Everything in Celeste has an exquisite design sensibility, from the levels themselves to the floatiness of the jumps to the reactive soundtrack. It’s one of the all-time great 2D platformers, for my money. It is patently ridiculous to put a game originally from 2014 on here, I know, but if I’m opening the door for the new Switch port of Hollow Knight I’m leaving it open for the new PC port of Cold Steel II. Just consider Celeste my favorite game of the year if you don’t buy it! Trails of Cold Steel is the third sub-series in the broader Trails saga, a series of JRPGs which begins with the Trails in the Sky trilogy, and continues with a duology that was never officially released in English. Although each new sub-series introduces a new main cast and is a reasonable jumping-on point, the Trails games are part of one contiguous story—more Dragon Age than Final Fantasy, say. Jason Schreier at Kotaku once wrote that “Playing Trails of Cold Steel is like eating a hero sandwich that’s way too heavy on the bread. Often you’ll get nice big chunks of turkey and salami. But sometimes—more often than you’d like—you’ll realize that all you can taste is fluffy white filler.” I actually think that’s an apt description—the parts of Cold Steel (and Trails generally) that most people would consider “the game” are pretty spaced out, and in between you spend an inordinate amount of time just…talking to people. Often it’s not even about anything in particular. I mean, look: I remember almost all of these people by name at first glance. I’m most of the way through New Game+ after spending 80-odd hours on my initial run. I played through Tokyo Xanadu, a game whose combat I didn’t even especially like, because it kind of works as Trails methadone until the next game in the series is localized. I would not be able to construct an argument that Cold Steel II is more tightly designed than something like Celeste, or better paced than the similarly interminable Dragon Quest XI, or even as good as some earlier entries in its own series. It’s a sprawling mess in a lot of ways, but its excesses are exactly to my taste, and there was no other game I enjoyed half as much this year. National Novel Writing Month, or NaNoWriMo, is a challenge to write 50,000 words during the month of November. I finished a couple of hours ago, my fourth “win” in six attempts. I like writing, of course, but I also specifically like typing. That distinction took a while to tease out. I consider “writing” to be the creative part of the exercise: coming up with characters and plot, crafting sentences, and so on. “Typing” is the mechanical part: moving one’s fingers over the keys and pressing them down and making the clackity noise. I don’t think I’d be able to get through NaNoWriMo without that second interest; it’s easy to think a story, but it takes a hell of a lot of typing to write it. It doesn’t seem to matter whether I plan or not. One of my failures included a bunch of outlining and character sketches I’d prepared ahead of time, and three of my successes, including this year’s, were largely extemporaneous. After a couple of days I had a vague idea of what the main conflict would be in this year’s story, but then my protagonist and antagonist had their first meeting and somehow resolved their differences right away! I rolled with that and spent the next 35,000 words writing slice of life instead. That kind of pivot would have been more painful if I had plotted out their entire arc ahead of time. It helps me a lot to frame this as “50,000 words of a novel” instead of “a 50,000-word novel.” (The summary on the website actually does use the latter, but then clarifies in the FAQ that “You will still win if you reach your goal but have not yet ‘completed’ your novel.” Of course, at the end of the day it doesn’t matter whether they officially sanction my framing or not…) I rely on the freedom to bail early on difficult scenes, leave plot holes and loose ends, write thirty consecutive lines of dialog if that happens to be easier that day, and so on. Even though I never end up with anything I’d want to show to people, NaNoWriMo is still a genuinely useful creative exercise. This year I spent a good portion of of my word count trying to work out the dynamic between my three main characters. I would write a scene with all three of them, then a couple permutations of pairs, then a scene where someone was off on her own, and then I’d get them all together again and repeat the process. I recast their interactions over and over until, 20,000 words later, the dynamic finally landed for me and they all felt believable. Again, this didn’t yield a satisfying and cohesive story—for one thing, their behavior is inconsistent because I only decided how they should act by writing them. But there’s nothing stopping me from lifting out the good bits for use elsewhere. Even if that only ends up being a few hundred words, that’s more than I started with, and I’ve already done the work of establishing the characters in my head. A new strategy that I employed this year: if I was in the middle of a scene that was going well, and I noticed that I’d already hit my word count for the day, I stopped there. For me it’s easier to rekindle that energy the next day and use it to build up a head of steam than it is to start a new scene from scratch right as I sit down to begin writing. I spent some time last month rereading my earlier NaNoWriMo entries, and once I got over the mental barrier of cringing at my own writing I began to really enjoy it. I’d forgotten most of the details so I was able to read the stories with fresh eyes. Plus, it was all perfectly tuned to my taste! If put on the spot and asked to pick a favorite musician, I’m probably be tempted to choose someone who feels suitably accomplished and respectable—Paul McCartney, say. Looking at the data, though, there’s an obvious correct answer: my favorite musician is Japanese singer-songwriter Ichiko Aoba. I’ve listened to her almost every day for several years now, nearly as often as every other artist combined. Aoba’s stock-in-trade is stark, ethereal compositions that draw heavily from classical and folk traditions. With only a few exceptions, all of her songs consist of a single vocal track and a single guitar track. They tend towards the slow and meditative. This live version of my favorite song of hers, 「奇跡はいつでも」 (“Kiseki wa Itsudemo”), is fairly representative of her sound. We’re back to a solid-color album cover, after her last album 「マホロボシヤ」 (Mahoroboshiya) was extravagant enough to have a photograph on it. 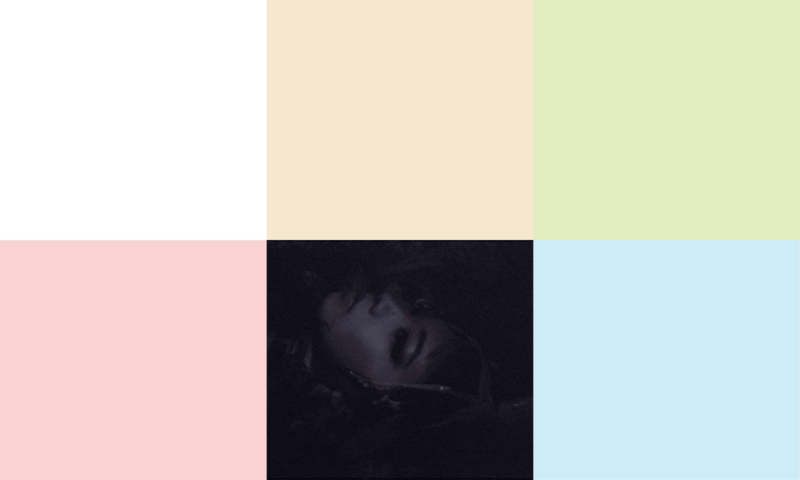 (Seriously, it stands out when you look at all six of her album covers lined up.) This seems somehow appropriate; Mahoroboshiya was timbrally ambitious for Aoba, whose musical palette is usually so restrained that having two songs with vocal harmonies (and one with piano!) felt groundbreaking. qp is more in line with her earlier work, so it makes sense that it looks like more like her earlier work too. That said, she does keep the all-vocal intro track idea from Mahoroboshiya. There, it was “the end”; here, it’s an excerpt from “La fontana di Valle Giulia all’Alba,” the first section of Ottorino Respighi’s tone poem “Fontane di Roma.” After that brief introduction, though, we’re back to single-track vocals and guitar for the rest of the album. 「みなしごの雨」 (“Minashigo no Ame”) is an early candidate for my favorite song on the album. I especially love that ♭7 in the melody that she’s grabbing from (I believe) a ♭III chord. I’m less sure if this one is intentional, but 「卯月の朧唄」 (“Uzuki no Oboro Uta”) sounds very much like a callback to another Utabiko song, 「あなたのかざり」 (“Anata no Kazari”): they’re both F major waltzes with similar tempos and harmonic progressions. There are two covers of songs by Anmi Yamada, a guitarist Aoba studied with. She had previously covered Yamada’s song 「機械仕掛乃宇宙」 (“Kikaijikake no Uchuu”) on the album 0, where it was a blockbuster centerpiece at twelve and a half minutes. Neither of the covers here feel quite so momentous; mostly I noticed that 「水辺の妖精」 (“Mizube no Yousei”) seems to be derived from Francisco Tárrega’s “Lágrima”—a song I actually knew how to play, once upon a time! Aoba’s music is starting to creep onto international streaming platforms (qp is on Spotify and Apple Music, for instance), so if any of this sounds interesting you may be able to listen without having to import it. XOXO is an event in Portland, Oregon that describes itself as “an experimental festival for independent artists and creators who work on the internet.” There are conference talks during the day, and a variety of festival-like events at night (film screenings, video games, live music, etc.). It ran annually from 2012 to 2016, took 2017 off, and then returned this year. I love XOXO. I’ve been lucky enough to go to all six of them—literally lucky, since it’s popular enough that the ability to buy passes is determined by a lottery system–and with that perspective, I’ve been thinking about the ways in which the conference has changed over the years. The speakers are different, for one thing. Conference cofounder Andy Baio has a fantastic blog called Waxy, which I used to read religiously (and am now reading again! ); when pitching people on the first XOXO, he said it was “the closest you’ll ever get to WaxyCon.” As a fan of the site that sounded great, but in practice it did seem like there was a certain insularity to the lineup. That improved over the years—more of the speakers were pulled from attendees’ suggestions, and XOXO became a much more interesting place where I learned about cool new people in addition to seeing folks I already knew about from Andy’s blog. The topics of the conference talks themselves have also shifted over time. There was initially more of a focus on moonshot success stories, a tendency which Darius Kazemi sent up at the 2014 conference to great effect. Those gradually gave way to a different kind of talk, the kind that I most closely associate with XOXO: frank descriptions of impostor syndrome, harrassment, loneliness, money problems, and the other difficulties of making a living on the internet, all delivered with the raw honesty I’d expect from people commiserating privately with friends rather than publicly on stage at a conference. These talks, I think, get at the core of what XOXO is about, to whatever degree XOXO is “about” anything. Perhaps the most noticeable change, though, is that XOXO has gotten big. In 2012 there were 400 attendees; after a few years of relatively modest growth, this year there were over 2,000. And while previous years’ events went out of their way to embed themselves into various Portland neighborhoods—even when that involved the organizers bringing their own AV equipment, and even bathrooms, to venues not naturally suited for conferences—this year they resorted (presumably out of necessity) to a more traditional venue, the Rose Quarter’s Veterans Memorial Coliseum. This definitely involved some compromises, both practical and cultural. The Rose Quarter is sort of a concrete wasteland, so it was both less pleasant and less feasible to hang out there than in past XOXO neighborhoods; I think I ate meals away from the venue twice as often this time as in any past year. Still, I personally thought the change was worth it. Not only were more people able to attend, but there was also more room for attendees with subsidized passes. (There were about as many people who came free this year as there were total attendees in 2012, which is incredible for an event of this size.) At the same time, I can empathize with the people who felt like something had been lost in the process—it was as though XOXO had to contort itself to fit a space that wasn’t shaped quite right, and we all had to expend a bit more effort than usual to keep it in place. My favorite talks were from Demi Adejuyigbe, Claire Evans, Jennifer 8. Lee, and Jonny Sun. Outside of the talks, I also enjoyed seeing comedian Cameron Esposito, enigmatic YouTube musician Bill Wurtz, and comedy duo Jean and John. At XOXO Arcade, the video game exhibit, I was excited to play Mineko’s Night Market, Ooblets, and Untitled Goose Game. I was already following all three, but it was great to see them in person. This isn’t directly XOXO-related, but I came into town a bit early this year to hang out around Portland. After spending an entire day in Washington Park, and nearly as long browsing through Powell’s, I think I’d still have had a nice trip overall even if the conference wasn’t any good. XOXO seems to attract an introvert-heavy crowd, but I’ve always found that most people are willing to strike up conversations with strangers all the same. It’s one of the friendliest events I’ve ever been to, and that remained true this year even with the larger crowd. Back in January I made some New Year’s resolutions about keeping up on a few hobbies, like playing music and meditating. I’ve had trouble with building habits in the past, so this year I tried a new approach adapted from two ideas in this blog post by Andy Matuschak. The first idea is to use fine-grained measurements wherever possible. Instead of setting a goal like “practice guitar three days per week,” for instance, I used “practice guitar for 60 minutes per week.” Fine-grained measurements don’t work for every type of habit—it’s not very useful to, say, cram all of your meditation into a two-hour session one day a week—but it works for most of mine. Both of these ideas were appealing to me for the same reason: they offer flexibility for maintaining a streak. Streaks are great for motivation, but traditional methods of measuring them can feel brittle. In the past, when I’ve set a goal like “practice guitar three days per week,” I’d sometimes get into a situation where it was Friday and I hadn’t managed to practice at all yet; then I’d think “Well, I already failed, so there’s no use now—I give up.” Not only would I not bother practicing for the rest of the week, but it was that much harder to start up again the next week since I didn’t have an active streak anymore. But when I frame the goal as practicing for a certain amount of time over a certain period, and without the constraint of it being within a calendar week, I never get into those situations. If I’m going on a trip, or I’m busy with work, or am just feeling too out of it to get something done one day, I don’t have to spike all of my progress—there is flexibility built into the goal. All six of my habit-based New Year’s resolutions still have perfect, unbroken streaks, two thirds of the way through 2018! To facilitate tracking this stuff more easily, I made a spreadsheet in Numbers that has two tables side by side. 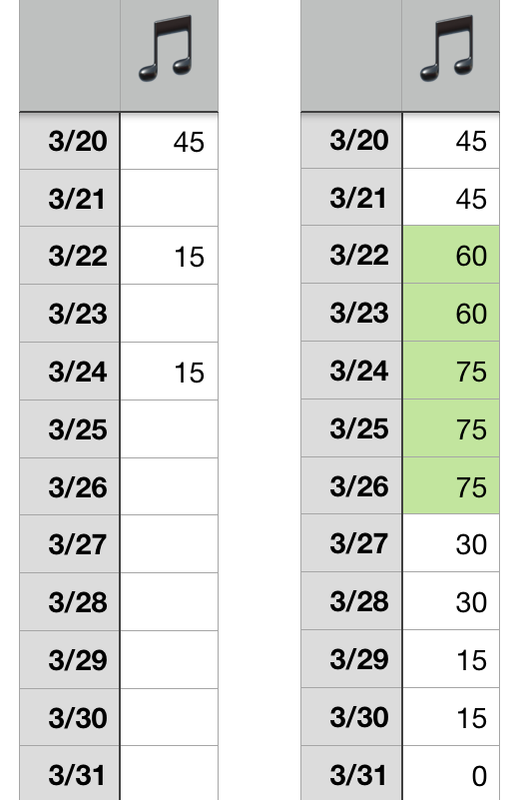 In the left table, I type in how much time I spend each day on various habits; the right table is then automatically filled in with a sum of the last seven days of activity, with conditional formatting to turn the cell green when I’ve hit that day’s goal. The result is something like this. When I’m busy (or tired, or lazy), I can look at my spreadsheet and see what the bare minimum is to keep my streaks alive. 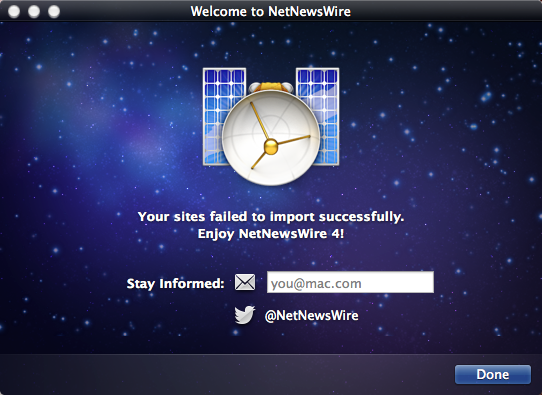 NetNewsWire was my first RSS reader and a constant companion for the better part of a decade. Eventually, though, Twitter overtook my Internet usage to the point where I got all of my links from there instead, and I stopped using it. Now that I’m trying to divest myself of Twitter, and since my Mastodon feed is orders of magnitude lower in volume, I’ve somewhat sheepishly picked RSS up again. Many of the blogs I used to subscribe to are gone, of course, but there are still some hanging on. (Let me know if you’ve got one!) I remembered having a bad first impression when Black Pixel took over NetNewsWire, so I’ve been experimenting with other options like ReadKit and Reeder, though none of them have felt quite right to me. And so I was glad to read today that Brent Simmons, NetNewsWire’s original developer, has finally gotten his app back. It sounds like he’s planning to continue developing it as a free and open source project. I’m looking forward to seeing how it turns out! This talk from NYU’s PRACTICE conference by Zak McClendon—who currently leads Pyschonauts 2 at Double Fine, and was once design director at Harmonix—is an all-time favorite. It’s useful to anyone who has trouble organizing ideas about games, design or otherwise.